Many of Pepperdine's ebook vendors support full text PDF downloads. This means you can download the chapter or book to your computer or device for offline viewing. In order to download ebooks from ebrary, EBL, or EBSCO, you will need to install the free software Adobe Digital Editions as well obtain as a free Adobe ID. To view these ebooks on mobile devices, you will also need to install an app such as Bluefire on your mobile device. For more information, see the Devices tab of this guide. Pepperdine University Libraries provide access to thousands of electronic books (e-books), spanning all subject areas. This guide will show you how to find, view, and download e-books as well as how to transfer e-books to your mobile device. This guide covers Pepperdine's major e-book providers and you can search for ebooks using the Library Catalog or on the providers' own websites. For in-depth instructions from a particular resource, click the desired tab at the top of this page. To find e-books using the Library Catalog, begin by using an advanced search using the library's online catalog. 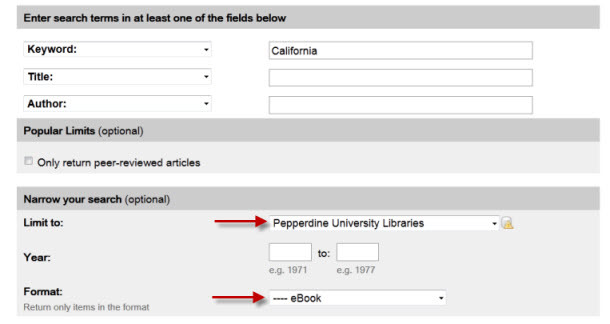 Here, you will want to narrow your search terms to Pepperdine University Libraries and the eBook format. When you have found a relevant ebook, click the ebook's title within the search results. 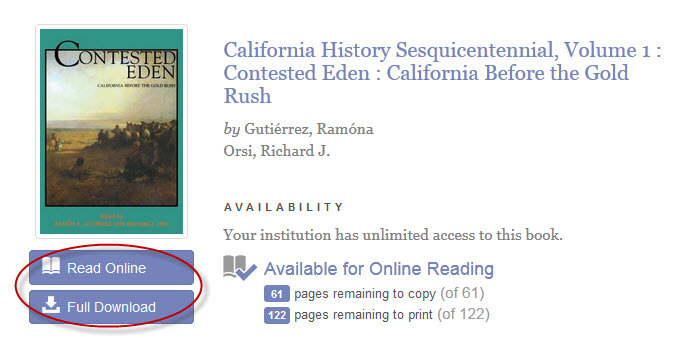 Under find a copy online, clicking View eBook will redirect you to the provider's site (ebrary in this case). Once you have arrived at the provider's site, you can read the ebook online or download the title. This process varies from provider to provider.